Delighting our guests is what keeps some families coming back to us year-after-year! We take every care to create a luxurious environment for our guests which includes two HDTVs, cable, hi-speed wireless Internet, free long-distance and many other amenities -- including a 2-car detached garage and guest parking on the street. We're just steps away from one of the most beautiful beaches in San Diego. Relax on the deck and listen to the ocean or enjoy one of the two community swimming pools and tennis courts. This is the perfect vacation getaway for family or friends! Thank you for phoning BEFORE 9pm East Coast time. San Diego remains one of our favorite places. It's where we see our grandchildren - and where we feel happiest during the year. We think your family will love it as much as we do! Sea Bluff sits on the edge of the Pacific Ocean overlooking one of the best beaches in Southern California. Our home is a quiet end-unit in a community that values privacy. It's so quiet that you will fall asleep to the sound of waves breaking on the beach. Every single inch of our house has been remodelled. We pride ourselves in keeping it feeling brand-new for every guest. The Master Suite enjoys the privacy of a full bathroom. The shared bathroom on the ground level also houses the washer and dryer. There are two heated pools in our community of Sea Bluff. HDTV, cable television in three rooms, wireless Internet access and free long-distance telephone. Sea Bluff is a gated community with security personnel admitting residents and registered guests. Two community swimming pools with one outdoor whirlpool. We keep our home in perfect condition and take pride in our many return guests - some of whom have come back for years! We stayed here with our three and five year old and it was perfect! The kids were most excited about the plastic colored plates and cups. It is a very well maintained and well supplied place to stay! Carole was great to communicate with as well. A great home only steps from the ocean! It was easy to call California and this beach property our home for ten days. Everything we needed and wanted was at hand. The beach home is nicely furnished, comfy, with a well-equipped kitchen plus many extras such as coolers, beach chairs, ice packs, and more! The house is centrally located near the highway, dining, and shopping areas. It was great to work with Carol. She was prompt in addressing all questions and made us feel very welcome in her home, complete with fresh flowers on the island upon our arrival. We look forward to a future stay at this house. Many thanks, Carol! Our family with 4 adult children absolutely enjoyed our stay in Carol's beach house. Carole responded to all queries timely and is very thoughtful. She even takes time to welcome us to come to the beach house a few hours earlier because it was ready. The beach house is very comfortable for 6 adults, very well equipped with lots of towels and blankets. The kitchen,especially,is well stocked with various spices. Such a spectacular home, close to everything and so comfortable! We enjoyed watching the sunsets each night as it was a few steps from the beach. The home exceeded our expectations. I would recommend this home highly! This place is wonderful. We instantly felt comfortable. We loved the location, the view from front room and balcony, access to the beach and pools. The house is cozy and well stocked. I would 100%recommend this place to anyone and we would definitely come back. Thank you. We couldn't say more about this property. From the beginning communicating with Carole, she was always prompt in response and provided more than enough information about the site. We have stayed at Sea Bluff for a few years and the location is perfect. This townhouse is the best so far. They have provided everything needed for a relaxing stress-free vacation. The kitchen is stocked, bathrobes in every closet, extra pillows, hide-away bed for extra guests, small table for little ones to eat, coolers, beach toys and chairs. Only recommendation is a couple updated chairs. They have also provided ample fans which are important on those hotter than normal San Diego days. We had no idea from the back deck we would have two views of the ocean. Perfect patio set to eat, play a game, morning coffee. The property is centrally located to the center stairs down to the beach and close to the pool. I would recommend this place to everyone. Thanks again to the Duffy family for sharing with ours! 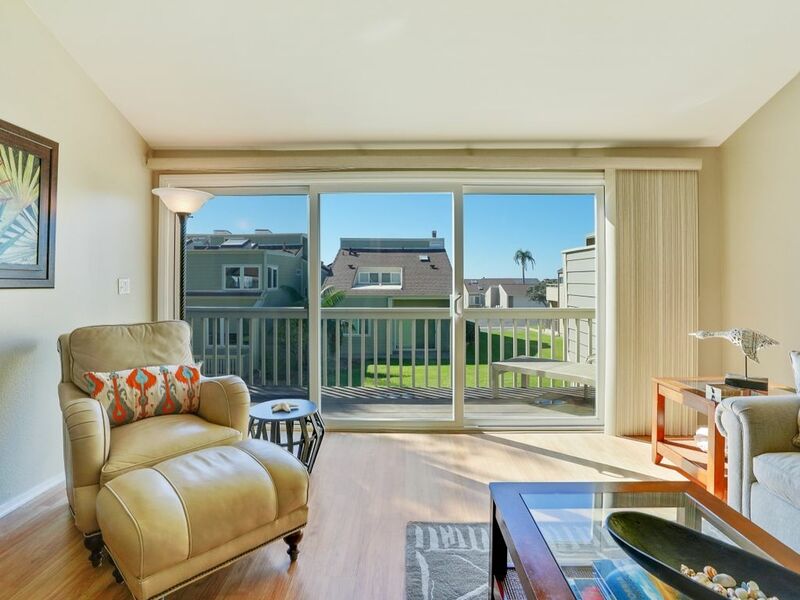 Located in the gated community of Sea Bluff, one of the most desirable townhouse locations in San Diego. Near many attractions including LegoLand, the San Diego Zoo, the Wild Animal Park, Sea World and only 90 minutes drive to Disneyland in Orange County. Our home is truly only steps to one of the best beaches in California! $1400 non-peak week or $2200 peak season week. The City of Encinitas requires a 10% Tax. The $300 fee covers the professional out-cleaning, all utilities & community registration for a 1 week stay. Our home is completely non-smoking. We do not allow pets of any size or variety. Thank you!